Progress is as progress does. I've come far with this project, evan learning a few things along the way. A new top, rip fence, out feed support and bench vise. I have to admit she feels like an old car you have taken and fixed up. You feel proud of her, like anything is possible. We are not done however. 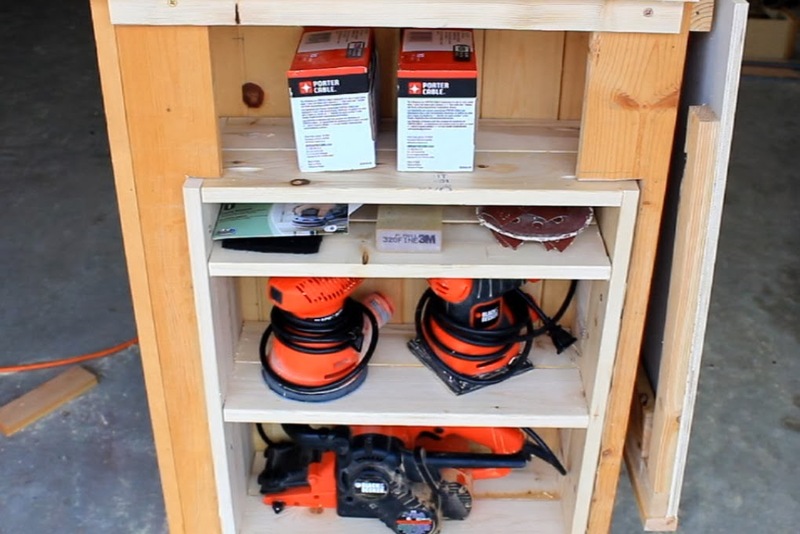 Storage can not be underestimated in a small shop. 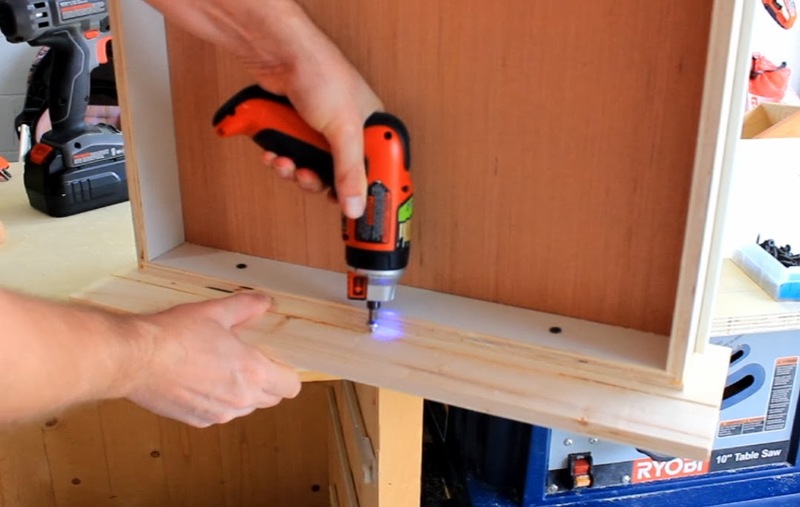 If space is at a premium and you lack effective storage, bringing in a new screwdriver to your shop can feel too much. 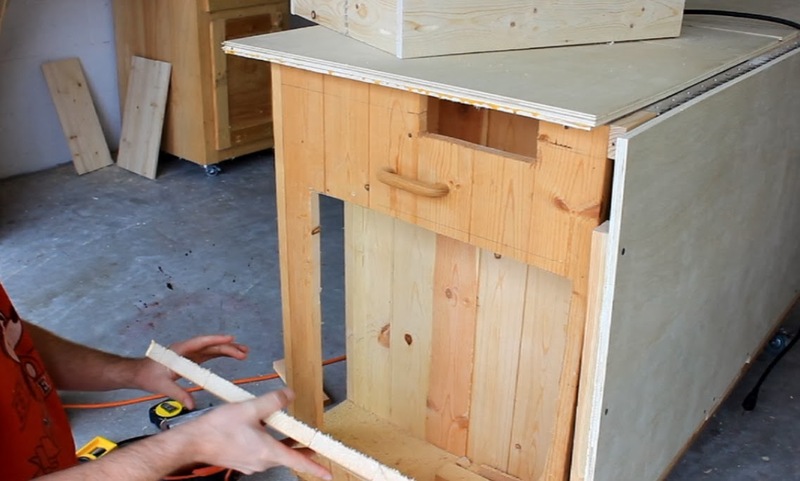 Cabinets are something I always thought was the solution to the problem of storage space. One can never have to many cabinets. Unless you forget about all the stuff in the second row of all those cabinets. 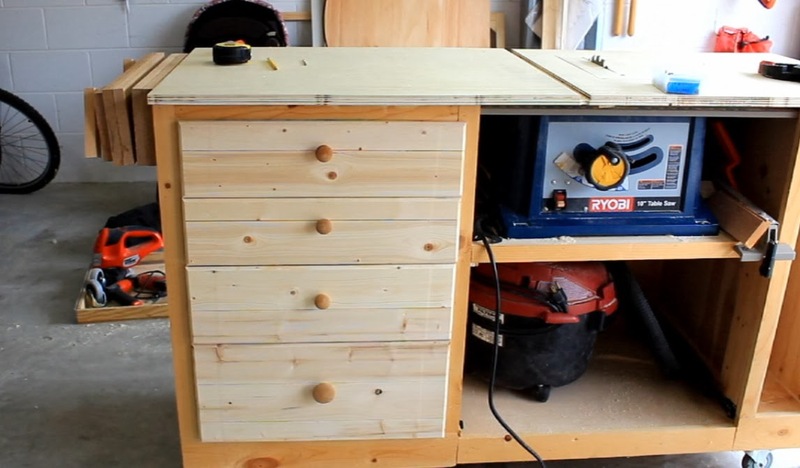 I find drawers to be much more effective at utilizing vertical space than cabinets. 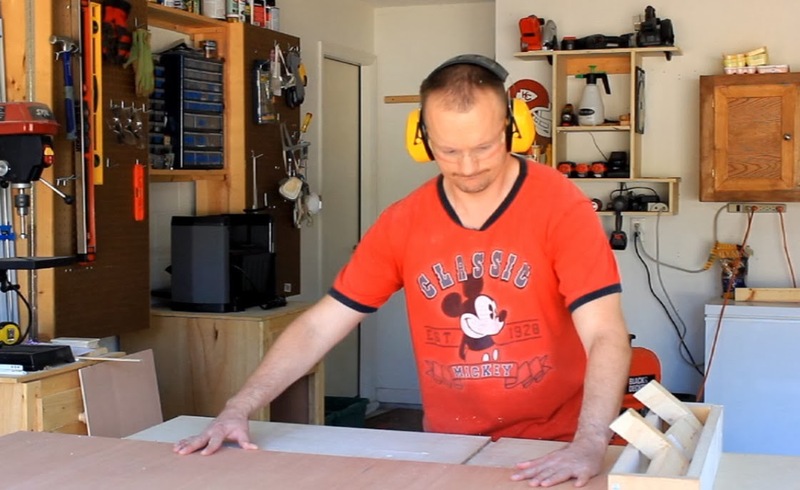 Ripping some 1/2" ply for the drawer sides. 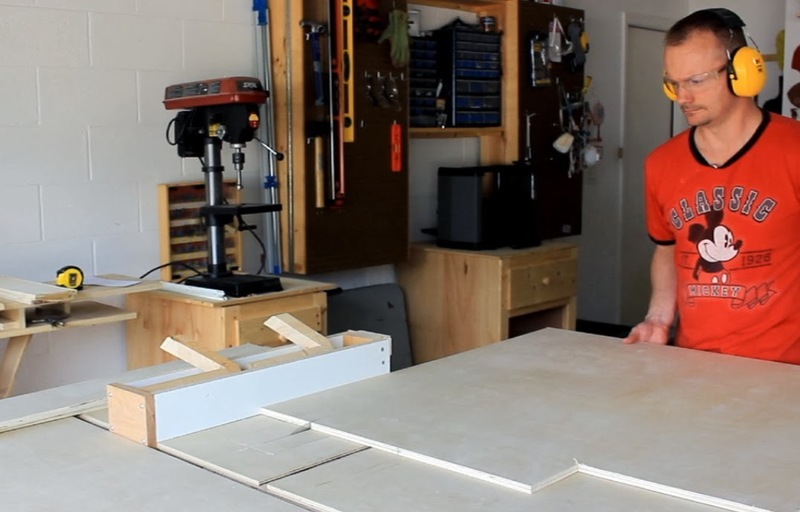 The miter saw with a stop block set up makes short work of cutting the sides of the drawers to length. 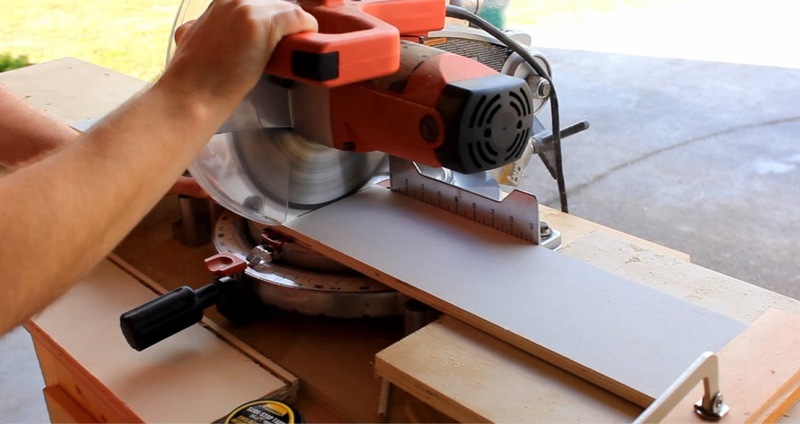 The use of a spacer when cutting the rabbets in the sides keeps the rip fence a comfortable distance from the blade. 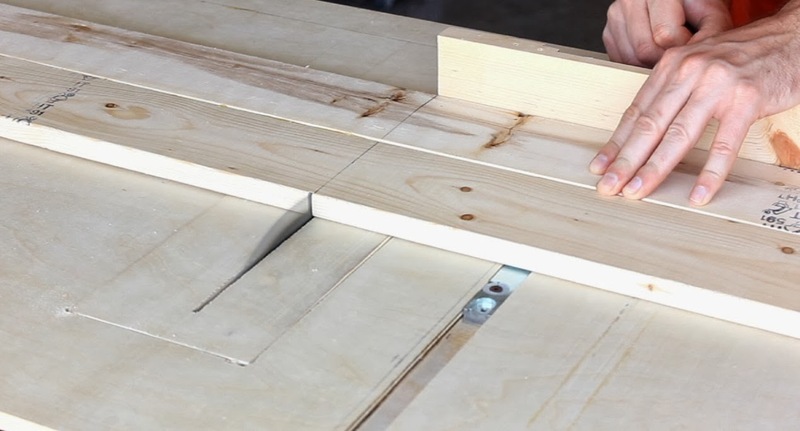 Using the rip fence alongside the miter gauge can cause kickback and injury. 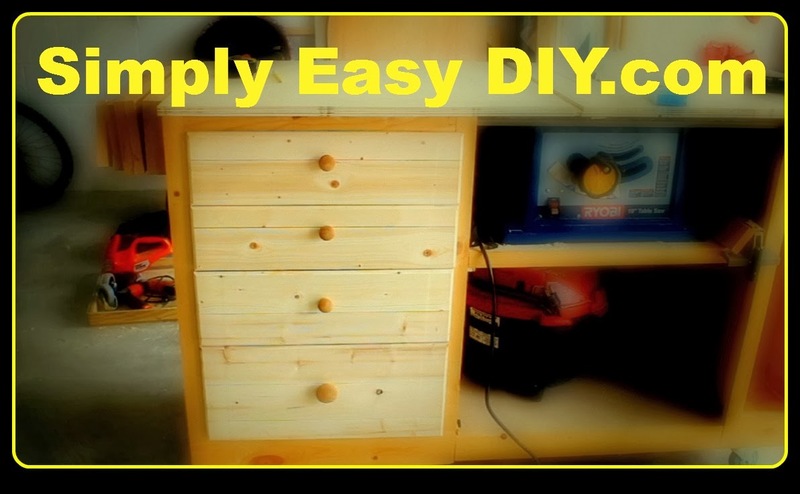 Using rabbets helps hide the daddo for the drawer bottom when the draw is assembled. When rip cutting make sure the workpiece stays flush against the rip fence and that your hands are a good distance from the blade. I like to lay out all my parts for a drawer before starting assembly. 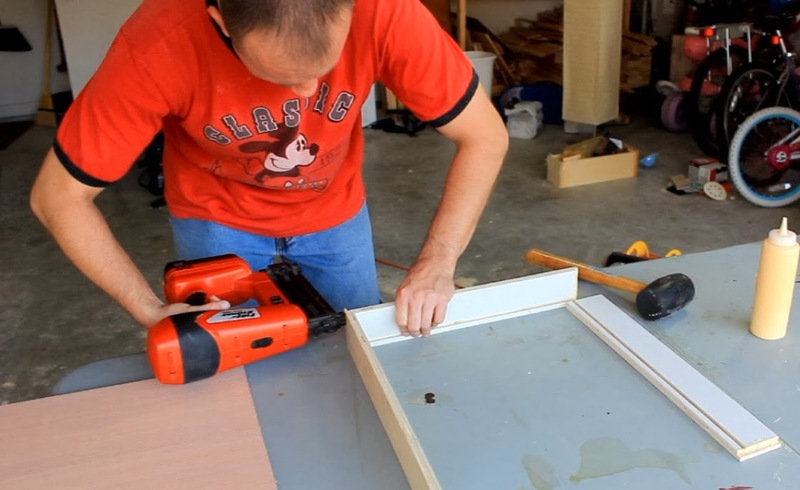 When I have two of the sides attached with glue and brads, I then flip the assembly up and slide the drawer bottom into the daddo. Sometimes some fiddling is necessary to get the bottom to seat into the lower daddo. Once that is done I glue and tack the last side in place. 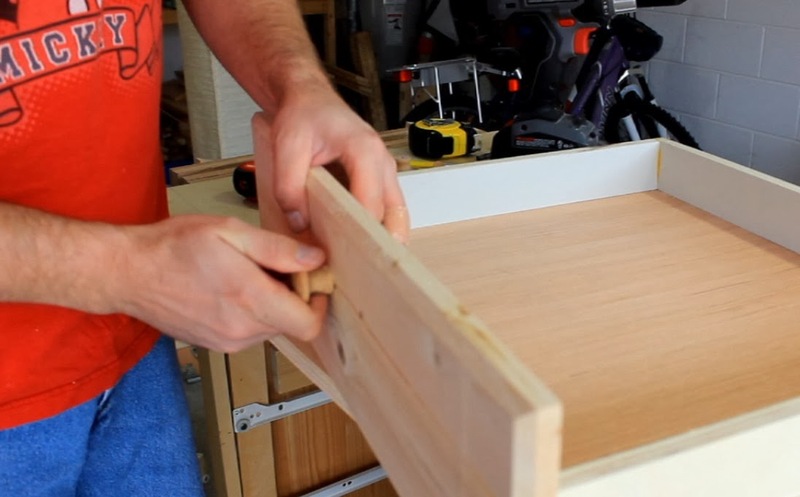 False fronts for drawers allow you to make the depth of the drawer deeper than the actual sides of the drawers. I cut these to length on the table saw. 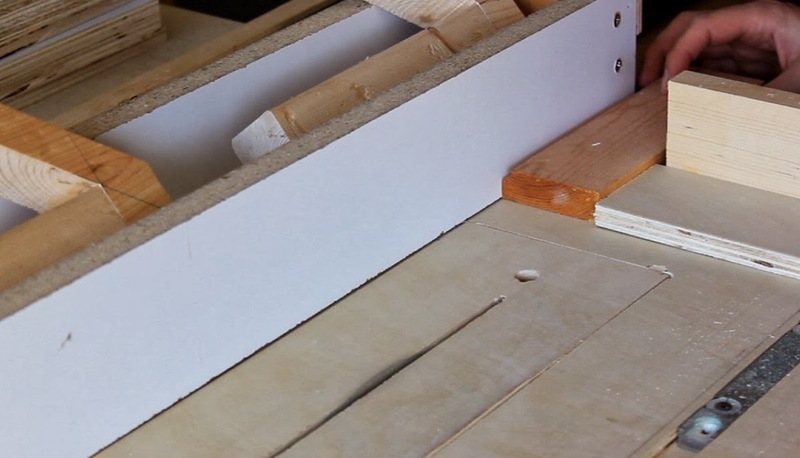 A bearing guided chamfer bit adds a bit of depth and shadow lines to the drawer fronts without getting excessively decorative. 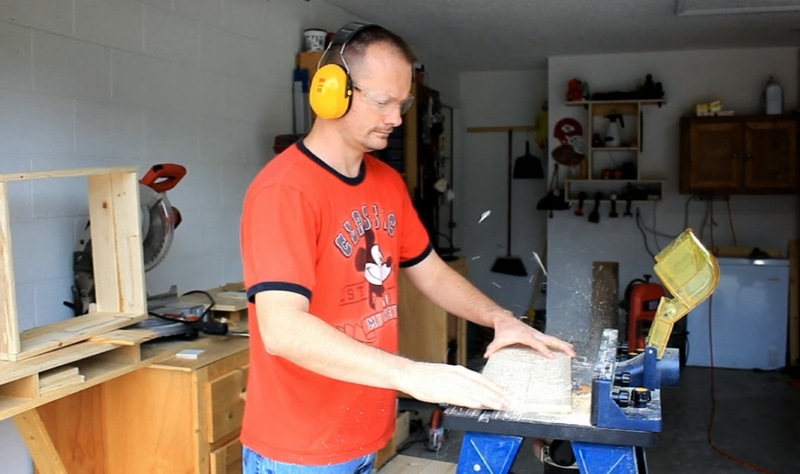 Remember to chamfer the end grain of a board first as it is the most likely to blow out on the back side. Chamfering the long grain second will allow you to cover that up. 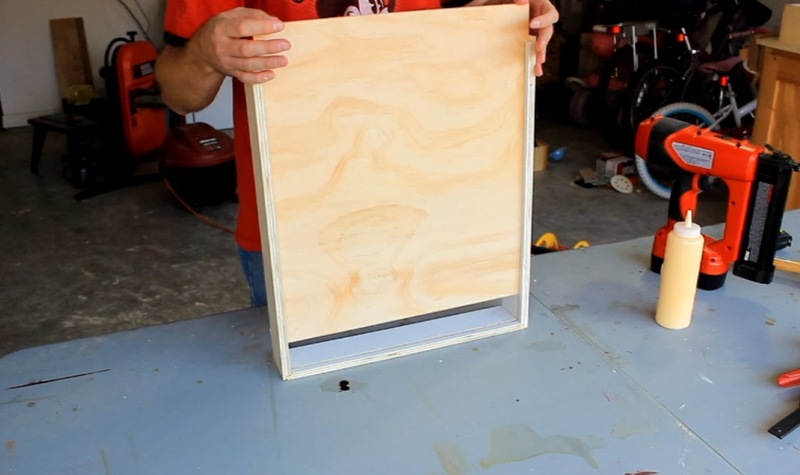 Centering the false front on the drawer is easy by simply setting the desired depth on your combination square and checking both sides. I like to prestart at least one screw before I center the drawer front. 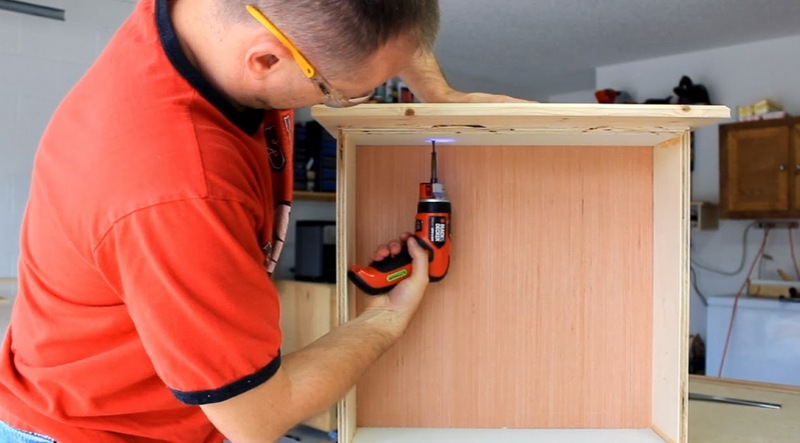 This allows me to just apply pressure to the top and fasten with the screw without the hassle of trying to start the screw and possibly throwing off the alignment. 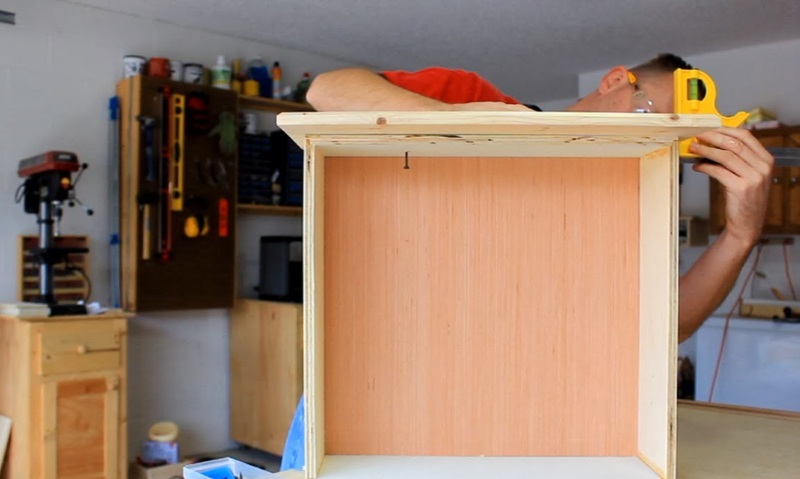 Split the difference of the width of the false front for the placement of the knob. Because these drawers are below eye level I find it is more pleasing to the eye if you place the knobs just north of the vertical center. I feel more organized already. But wait, we are not done. 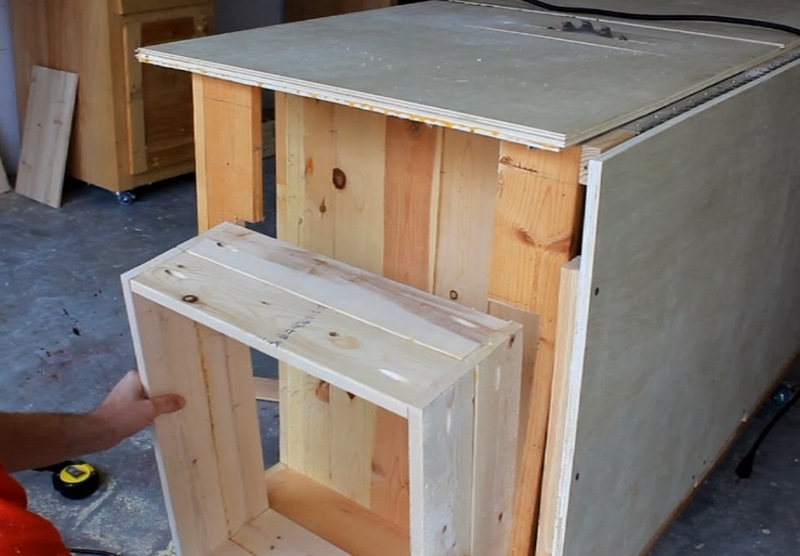 The side cabinet was to then and the drawers to deep. I also did not feel it to be the most aesthetically pleasing configuration. I think by cutting out the side section and utilizing this cabinets depth on a different axis, I'll get much more useful space. Cutting out the side section proved to be somewhat of a challenge. While I was cutting some of the glued panels that were already weakened by the placement of the old bench vise cracked and had to be removed. It was not part of my plan but sometimes in woodworking you have to roll with the punches and be ready to change your plans on the fly. Cutting out the side section proved to be somewhat of a challenge. While I was cutting, some of the glued panels that were already weakened by the placement of the old bench vise cracked and had to be removed. It was not part of my plan but sometimes in woodworking you have to roll with the punches and be ready to change your plans on the fly. There is a few inches of space in the front where I installed this unit. I was going to just put a false front up and close it in for aesthetic appeal but then I had an ideal for a future project for this space. If you have not seen the video, you can check it out here. Be sure to visit my youtube channel to "like" and "subscribe". 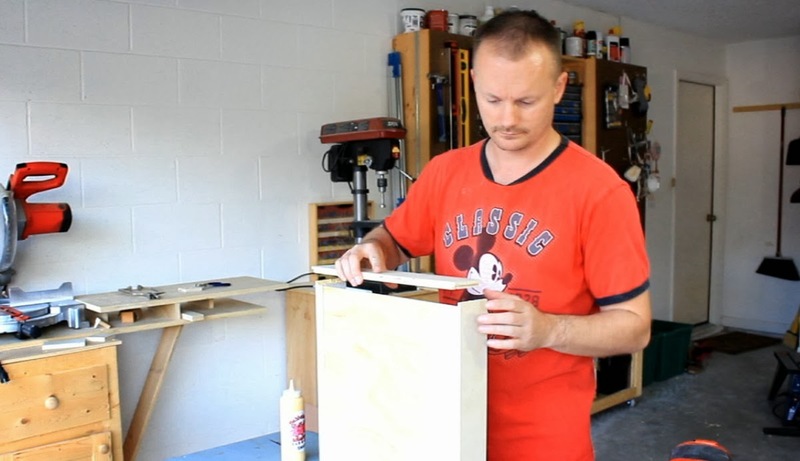 Has putting your table saw in this cabinet made it any quieter? I have an old Makita of about the same spec but it is really loud and the neighbors are complaining. No, it does nothing for the sound. I researched this very idea a few years ago when we lived in a condo. I deemed it to be more trouble than it was worth. Sound proofing the underside of the top would be the Achilles heel.